At $4.87B, Apple’s traditional personal computer segment of desktops and notebooks (‘portables’) continues to grow, but today represents just 24% of total revenue. 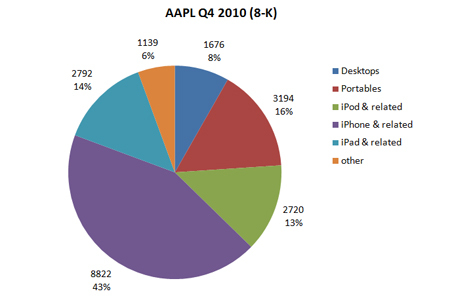 New personal computing, represented by the iPhone, iPod and iPad ecosystems, is now 70% of the business. Year over year, Apple’s traditional PC business grew 22%, and new personal computing grew 99.3% for a combined growth number of 67%. 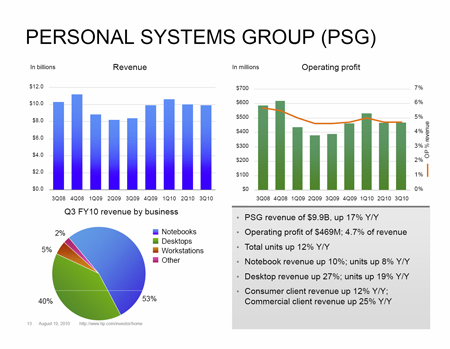 In HP’s Q3 (May-July), notebooks, desktops and workstations represented 98% of the $9.9B business segment, and total operating profit was $469M. Year over year growth was 17%. To be fair, HP’s Q3 is a seasonally weak quarter and the 4th quarter will likely show a jump in revenue; also, results from the Palm acquisition will show up in Q4. HP will report in mid-November and we’ll revisit the comparison at that point. Until then, at double the revenue, 4x growth, and 9x profitability, the new revolution in personal computing appears to be going rather well. This entry was posted on Tuesday, October 19th, 2010 at 4:03 pm	and is filed under strategy. You can follow any responses to this entry through the RSS 2.0 feed. Both comments and pings are currently closed.